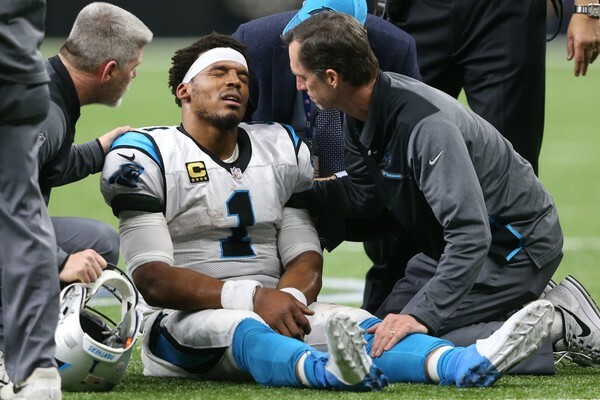 Although most everyone, including my family (and the rest of the world), would say my quarterbacking career never reached the same apex as that of Cam Newton, I would still hope that if I was exhibiting signs of a suffered concussion like Cam showed in last Sunday’s wild card playoff game that I would have received better, or at least some appropriate, medical evaluation and care. On Sunday, Cam was seen staggering to the sidelines before falling on the field. Were we going to see the last of Cam due to the concussion protocol? With amazing speed and without the seeming appearance of any real medical evaluation under any formal concussion protocol, Cam reappeared like Superman when the kryptonite disappears. With all the actions taken to allegedly protect players, Sunday’s lack of medical oversight was a glaring black spot for the league. The greater awareness of chronic traumatic encephalopathy (CTE) injuries prompted the NFL to implement stricter protocol regulations to minimize the potential lawsuits brought by players who return to play too soon after suffering a concussion and ultimately suffer from CTE. The stricter revised concussion protocol opens the door for liability to be placed upon the medical professionals and league if proper player evaluations and protocol is not followed. Cam Newton is attended to by medical personnel during the Carolina Panthers vs. New Orleans Saints playoff game on January 7, 2018. In Cam’s situation and the revised protocol, there appear to be some grey lines that are left open for interpretation as to the medical professionals and/or organization’s understanding of the protocol. The first step of the protocol requires the medical professional to re-watch the play and if there is any suspicion of a suffered concussion, the player is automatically escorted to the locker room. In fact, the concussion protocol is supposed to require players who stumble or fall, when trying to stand, to be immediately sent to the locker room for evaluation. Unless you were not watching, you saw Cam fall. He claimed an eye injury. I guess he could have tripped on a line on the field but that is a remote result. 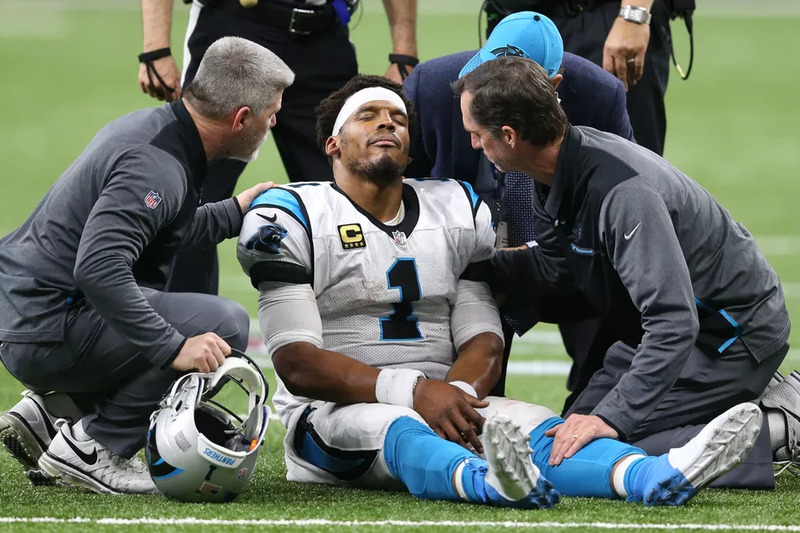 Cam’s case shows that the medical professionals are permitted to apply an inconsistent standard as to sending a player to the concussion protocol. Cam clearly wanted to return to the field just as the Panthers wanted him playing. I think the medical staff incorrectly evaluated this injury, regardless of whether it was truly an eye injury as Cam relayed to the medical staff. If the medical staff had followed the protocol after he fell, they would have re-watched the video and sent him immediately to the locker room for evaluation. If they were to find he suffered an eye injury after following the protocol, there would be no issue and he could go back into play. Cam never left the field. When I was re-watching the play, my uneducated medical opinion could easily infer that the hit suffered by Cam dazed him such that someone could have easily suspected that he could have “possibly” suffered a concussion. The protocol only requires that upon suspicion of a concussion further evaluation is required. CTE damage is so severe and life-changing that medical professionals should err on the side of caution. Cam was not qualified to determine if he should or should not be in the concussion protocol. Cam wanted to play and win. Maybe in the heat of the moment so did the medical staff. If the NFL is going to abide by the new protocol, they need to ensure they are abiding by it correctly and do not rely on a player’s self-diagnosis when evaluating a potential concussion injury. Bernard D. Nomberg has practiced workers’ compensation law in Alabama for more than 20 years. Bernard has earned an AV rating from Martindale-Hubbell’s peer-review rating. He has been selected a Super Lawyer by Super Lawyers Magazine as well as a Top Rated Attorney by B-Metro Magazine. Bernard is the Chair of the Alabama State Bar’s Workers’ Compensation Section.